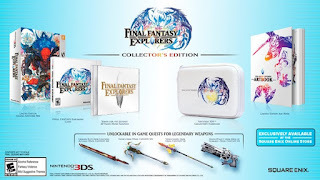 SQUARE ENIX® revealed the Collector’s Edition for FINAL FANTASY EXPLORERS® that will be limited and available exclusively through the Square Enix Online Store. The Collector’s Edition will also have codes exclusive to the Western release to unlock in-game quests that allow players to obtain a set of legendary FINAL FANTASY® weapons. These weapons include: Venus Gospel fromFINAL FANTASY VII, Death Penalty from DIRGE of CERBERUS®: FINAL FANTASY VII, Crimson Blitz fromLIGHTNING RETURNS: FINAL FANTASY XIII, and Thyrus from FINAL FANTASY XIV. FINAL FANTASY EXPLORERS will be available on Jan. 26, 2016, for Nintendo 3DS in North America, and will be priced at $39.99 MSRP. The Collector’s Edition will be sold through the Square Enix Online Store for $69.99.